My girlfriend and I are starting to become Martini fanatics. We have a ratio we like but have yet to find the perfect olives. We are hoping someone knows a place to get great olives that have good flavor and a decent firmness. Bonus points if they're stuffed with a quality cheese (blue or Gorgonzola). A lot of supermarkets have olive bars now. But Omar's question makes us curious if there's some place -- maybe it is a supermarket, maybe a smaller market, maybe someplace completely different -- that is the place to buy olives around here. Because of quality or selection or whatever. Got a suggestion? Please share! And a sentence or two about why they place is worth checking out is alway helpful. If Omar wants to get really ambitious, I've seen uncured olives at the WF Ryan market on Railroad Ave. Ambitious option #2 is using Hendrick's and lacto fermenting their pickles. I'm sure I could think up some dumber and more labor intensive alternatives given some time. The Cheese Traveler has a nice selection of olives from all over the world. Another local store is Cardona's. Again, a wide selection. Shop Locally! As an olive obsessed person, I love the olive bars at Fresh Market, Honest Weight and Healthy Living. I stuff my own with blue cheese, easy and worth it. Cardona's also has a great selection. Best olive bar for a wide selection is Price Chopper in Latham. You can get them stuffed with blue or feta cheeses, garlic, red pepper, pimientos etc. For prices and good quality, Garofalos market in Schenectady. I expect some other Italian markets have the same quality but not necessarily price. Olives aren't a local product obviously, so it comes down to who does the best job of putting together an assortment. I've tasted all the half dozen or so purveyors of olive bar stock and would say that DeLallo, which is found in Price Chopper, is the best. I'll also happily endorse anything that is available at Cheese Traveler. As for artisanal varieties or curing your own, I'd say based on the interest in cheese stuffed olives that a well stocked olive bar is what the OP is looking for. Fred the Butcher in Halfmoon carries large sized jars (maybe a quart?) of large, blue cheese stuffed olives. Price seemed pretty reasonable. I would recommend Cardona's and Honest Weight for olives, hands down. Can we take a step back for just a moment. I know that people have their own individual tastes. But isn't anyone going to speak up on behalf of the martini? I know that there are cocktail enthusiasts out there who like olives in their martinis. And some, I assume, are good people. But I have to draw a line at blue cheese stuffed olives in a crisp, clean, and clear drink. Perhaps there is a way I can take Omar out for a drink and at least show him the path of the purist. He may still end up preferring a cheese tinged tipple, but I'll be able to sleep better at night knowing that I tried. Honest Weight COOP, Cheese Traveler, and Cardona's all have a great mix to choose from and many creative options to explore. Make your own? I've made my own blue cheese stuffed olives with some really good blue from the Cheese Traveler. Those were by far the best martini olives I've ever had. The problem with olives from an olive bar is that they are usually in oil and not brine and I do need some brine for a dirty martini, so I buy a cheap jar of pimento olives just for the brine. Omar, Take Daniel B up on his martini offer! Completely missed the fact these are for a martini. 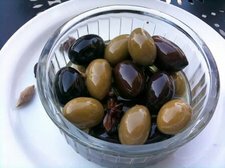 The olives at an olive bar are in general packed in brine but it's something to watch out for. An oil slick on the top of a martini does not sound appetizing. Now I am fascinated by the idea of the cheese stuffed olive in the martini. I bet once Daniel B and Omar do their taste test, the Profusser will be the one converted. Anyone want to take me up on it. Burnt, most of the supermarkets around here have a few varieties of jarred stuffed olives -- blue cheese, feta, garlic, jalapeno, at least -- and I would guess specialty stores might have them and more. I'm willing to sacrifice my liver to do a comparison of olive them. Brave, I know. Discussion to follow on the role of the olive in the martini and possible substitutions. @Daniel B. My people will call your people.